Spike Jonze’s fourth feature (don’t worry, he’s been making plenty of videos, shorts, and other, I’m sure, high-paying ephemera) is full of rich ideas. It also arrives with an in-built deadline. If, for any reason, distribution of this film was to be delayed for, say, nine months, it may arrive dead in the water, yesterday’s news. It is so au fait, so zeitgeist, as to almost be prescient. It is as current as this morning’s newspaper, if such a thing really still existed. It is of the now. See it now. It may feel quaint by the time it’s available for home viewing, like a movie from the 90s with mobile phones the size of egg cartons. This is very significant, if, like me, you ponder the creation of movies. Jonze wrote the script all on his own, and he must have been at least a little nervous – I certainly would have been – that technology would beat him to the punch. It could easily have been, as he began page 60, that Apple or some such was preparing to launch precisely the kind of incremental yet seismic technological step forward before his film even rolled camera, let alone hit cinemas. That step forward is, quite simply, an AI (artificial intelligence) system – an “OS” (operating system) – that fools the user completely, that seems human. And the film is, at its heart, very simple: such an operating system is created, and a man falls in love with it. Story. 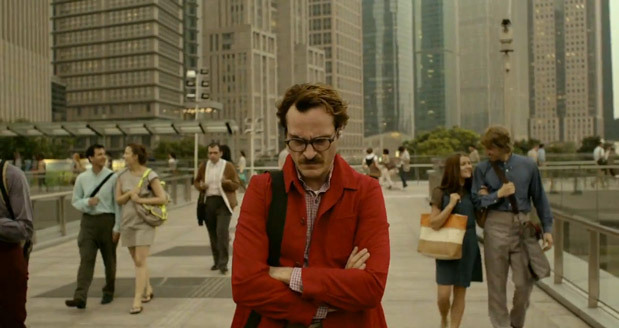 The man is played with limitless depth, however, by Joaquin Phoenix, and the script is very smart. The first sign of great intelligent life is the production design, exemplified and encapsulated by the first scene, in a modern office, where Theodore (Phoenix) works. He writes old-fashioned personal letters (by dictation to a computer) for other people; they’re back in vogue, it seems, as are pastels, moustaches, high-waisted pants and generally polite behaviour. Coloured pastel panels adorn the comfortable office, and I instantly cottoned on to Jonze’s unique genius, or at least social advantage: he was in with Apple, and they’d not only told him he could get his movie out before they launched a computer that seemed human, they’d also give him and his production designer (K.K. Barrett, costumes by Casey Storm) a sneak peak of iOS7. Because the design here is no doubt inspired by iOS7. You feel like you’re inside it. Pretty soon Theodore is inside his own new operating system, and I won’t get into any more plot than that. Suffice to say, this is very much a classic love story, but coloured by science fiction (we don’t now how far in the future we are, but it’s definitely the very near future), philosophy, and Jonze’s interesting, curious mind. He’s concerned with intellectual probability: the film doesn’t necessarily travel according to what would make the story work best as a movie (although it has ended up working extremely well indeed); Jonze, I feel, has asked himself, and really thought about, in consultation with those who may know (hello, Apple?) – what would happen, and, given that genius AI is but moments away, what will happen? For me, the voice of ‘Samantha’ would have been much better left unidentified, or better still, computer generated – that way, each viewer then constructs their own version of ‘Samantha’ – whilst also pondering the larger questions posed by the film. Lots to like about the film, but at its core, I think it failed. Interesting comment Janis. While I liked Johansson’s performance, I completely agree that a computer generated voice would have been the boldest and most completely “true” choice for the material. Are you aware that the entire role of the OS was originally played by Samantha Morton — ON SET — and that she was replaced by Johansson in post-production? thanks for the reply CJ – no, I wasn’t aware that Morton originally played the OS – I recall seeing her name in the credits in some production area. I guess using Johansson (and her star power) is involved with ‘marketing’ the film – however, I think that choice entirely destroys the capacity, and indeed willingness, of the audience to suspend their disbelief and embrace the concept being offered.